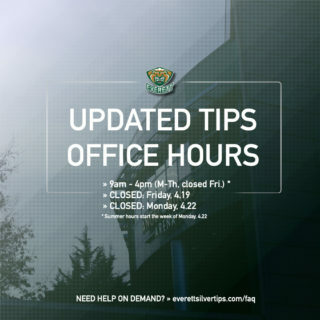 The Silvertips and Thunderbirds battle for the sixth meeting of 10 this season … it is the first meeting in Everett between the two teams since Dec. 15, 2018 when the Silvertips defeated Seattle, 6-1 … Bryce Kindopp leads both teams in scoring for the series with nine points in five games … the Silvertips have won eight straight regular season meetings … the Tips are 18-6-1-1 against opponents from the U.S. Division … tonight’s game is the back end of a “home and home series”, where the Silvertips have 18 home wins, fourth most in the WHL. 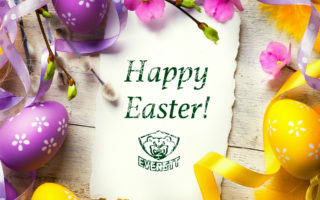 EVT 5 – SEA 2 (2-1-19): Bryce Kindopp earned a natural hat trick, the first of his career, while forward Zack Andrusiak notched a four-point night (1g-3a) in his return to Kent as the Everett Silvertips defeated the Seattle Thunderbirds, 5-2, before 4,513 at the accesso ShoWare Center on Friday night in WHL action. 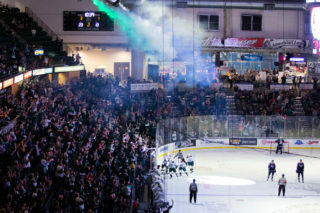 The Silvertips potted four goals in the third period to seal their victory, moving to 5-0-0-0 this season over the Thunderbirds and winning the last eight meetings, while they went three-for-five on the power play, backed by a 29-save performance from Silvertip goaltender and reigning WHL and CHL goaltender of the week, Dustin Wolf. 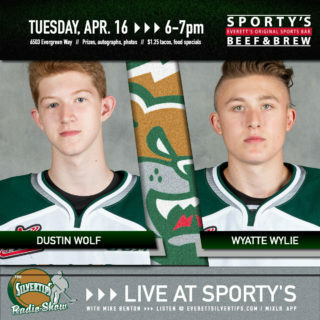 HOWLING WOLF: Dustin Wolf this week was named WHL and CHL Goaltender of the Week … he has been listed along with Tips D Gianni Fairbrother to the NHL Central Scouting midterm rankings … since Nov. 1, he has the lowest goals-against-average (1.86) in the WHL, with a minimum of 500 minutes played. ZACK ATTACK: Tips forward Zack Andrusiak, acquired Jan. 1 from the Seattle Thunderbirds, returned to Kent for the first time since the trade last night and bagged four points (1g-3a) … his fourth career hat trick helped lift the Tips to a 9-1 win vs. Lethbridge last Saturday … as a Silvertip, he has 8 goals in 12 games and his 35 goals are 3rd in the WHL. 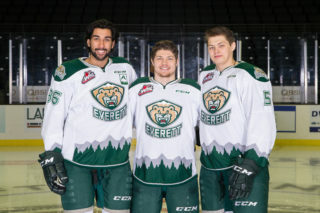 OPEN THE FLOODGATES: After enduring a three game losing skid where they scored four goals, the Silvertips rebounded to now run their win streak to three games, scoring 16 goals in that span. BRYCE YOURSELVES: Bryce Kindopp had his first career hat trick (natural) last night and has scored 10 goals since Jan. 1 … his 28 goals are a new career high.